In Nain, Nunatsiavut, during the fall of 2011, there were seven suicides among Inuit male youth between the ages of 14 and 21. A group of youth whose peers were dying by suicide were highly at risk for suicide, presenting with suicidal ideation and serious attempts. These youth also lacked stable home environments and thus had few adults in their lives who could keep them safe. The innovation consists of a community led program based on intergenerational healing through the transmission of Inuit skills such as hunting, fishing, gathering wood and wild plants, building Kamutiks (sleds for carrying supplies), fixing skidoos, making arts and crafts, wild food and movie nights, to build individual and collective resilience. “They know that they can go up to people who take them out on land and talk to them and have a conversation about hunting or have a conversation about anything really. Some of these harvesters didn’t know the youth before and the youth didn’t have any connections with the harvesters, but expanding their circle of people that they can go and have a conversation with, and their circle of friends has grown for sure. Now they’re so outgoing and come up and have a conversation with you." Transmit environmental knowledge, skills and values from experienced harvesters to youth. Youth participants are typically socially isolated when they become involved with the program. The Going Off, Growing Strong (GOGS) staff engage with youth during program activities and build relationships with the youth. Harvesters use time off on the land to connect with you in an experiential setting of doing and teaching. Youth use the program office area, which acts as a base for land-based trips, food processing and food delivery in the community, as a drop-in centre. Social supports are available and provided by program staff who aid youth with coping skills, life events, as well as resume writing, program and job applications and inclusion in community activities. 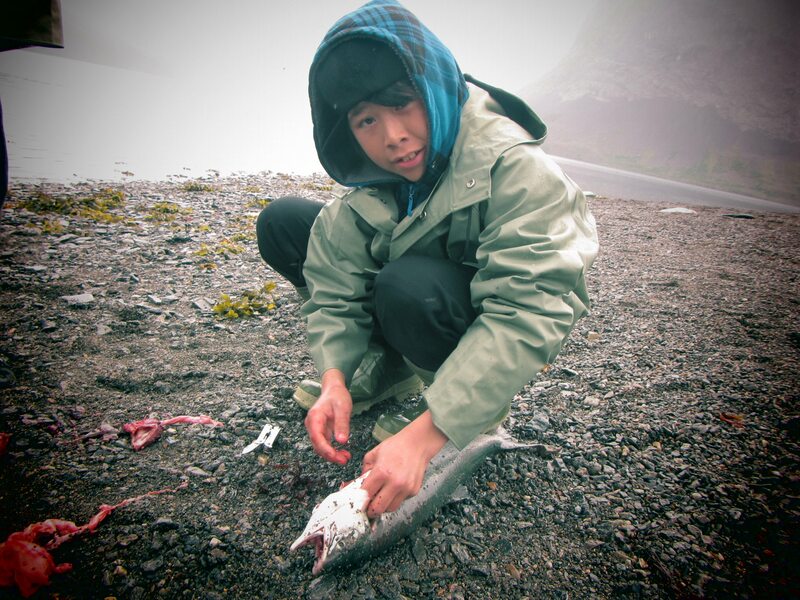 Youth participate in activities on the land with harvesters who teach and facilitate intergenerational learning of traditional Inuit skills. 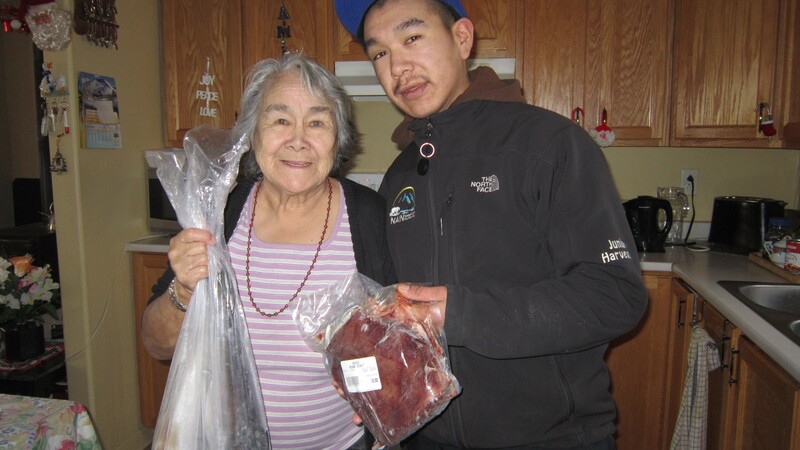 Youth participate in community-based activities including the processing of country foods for delivery to community elders. Youth learn how to make traditional Inuit crafts and clothing items in the program office. Through the engagement of youth via the traditional skill transmission, youth build relationships with harvesters and outreach staff, both outside of the community – off on the land – as well as within the community, at the program office, as well as through inclusion in various community events. These mechanisms work in tandem to foster relationships while enhancing and promoting cultural connectedness and skill development. Funding challenges continue to arise. Finding on-going, long term funding for multi-disciplinary initiatives such as this where multiple outcomes, across multiple sectors are demonstrated is challenging. Continuous intensive support and programming for our participants is difficult to maintain given capacity (human resources, financial) limitations. The evaluation is embedded within a Participatory Action Research (PAR) framework and uses a mixed-method design. PAR exists within a broader research tradition of participatory research, which draws on constructivist and critical theory, highlighting community action in addressing research problems, and evolving from the 1970s when researchers began to adopt a social justice standpoint in low and middle-income country health. Qualitative methods include semi-structured interviews with youth, caregivers and involved professionals and staff daily observation logs. Quantitative data is being collected via an online timeline of activities, psychometric tools being piloted in this setting and a chart review of participants; mental health and medical charts. Evaluation methods were adapted after learning from the first cohort. Qualitative interviews were conducted once at the end of the first cohort, whereas in the second cohort they are being conducted at the beginning, midpoint and end of the program cycle. Pre-post surveys that were implemented with youth in the first cohort were found to be too onerous for most youth, therefore these were changed to the daily observation logs recorded by staff. Psychometric tools and data from the chart audit mentioned above were added after the first cohort culminated. Both cohorts tracked activities and youth-days out on the land and in programming. Evaluation data collected during the first cohort, which ran from January 2012 to August 2013, have been analysed and submitted for publication. Data is currently being collected for the second cohort of youth (started in January, 2014) and includes daily staff observation logs, tracking contact time, qualitative interviews with youth (and adults connected with youth), quantitative clinical health assessment tools, medical chart reviews and RCMP record reviews. Implementation of such an intensive program with a highly at-risk population in a high risk remote, subarctic environment is expensive. The cost is approximately $20,000 per youth per year. Cost of living as well as goods and services is significantly higher in northern, isolated regions of Canada relative to southern more densely populated areas, which adds to the overall cost of program implementation. In addition, health care services are also more expensive per capita relative to southern Canada. For example, the cost of a single medical evacuation from Nain to the nearest hospital in Goose Bay is approximately $5,000 for a flight alone. Community suicide rates have decreased dramatically since the inception of the program. There have been three since April 2012, including one male youth suicide. Male youth were identified as most at risk and were the initial target demographic of the intervention. Qualitative interview results demonstrate that youth feel more comfortable accessing help for negative thoughts, suicidal ideation and chronic/traumatic stressors. Three youth from Cohort 1 became employed as a result of skills they gained throughout the program. Qualitative interview results indicate that youth in Cohort 1 showed an improvement in their self-perceived traditional skills, their self-reported self-esteem, mental health and physical health, their social skills, ability to interact with adults, school performance, comfort level with asking for help with difficult emotions and external behaviors. Wallerstein N.B, Duran, B. (2006) Using Community-Based Participatory Research to Address Health Disparities. Health Promotion Practice;7(3):312-323.